Did I really promise a host I’d bring an appetizer for a party for 30 tonight? What was I thinking? It’s a Friday in December–my legal pad can’t contain my to-do list, and I’ll never be able to manufacture enough time to assemble something suitable. Adding to the drama is my busy, paranoid little brain. I’m sure, I imagine, they’re expecting some deliciously original “amuse bouche“, given my line of work. Today my stars are not in alignment: Planet Fantasy is colliding with Planet Reality. Stars, I muse, hmmmm. I can, at the very least, festively dress up a platter of cheese with star fruit. The best most towns of our size can muster up is some cryovaced brie and goat cheese. Not so in Ann Arbor--Bon Appetit’s runner-up for best small foodie town in America. We’re blessed with merchants who deliver our populace an excess of riches in the cheese category. We can tip our hats to Zingerman’s for assistance with that Bon Appetit honor. If you want to deliver an uncompromised cheese board that can stand up to the most serious of wines and palates –head to Zingerman’s. Their well-educated staff will happily dispense samples and erudite advise on every cheese in their case. But if educating Pabst-drinking Uncle Ed as to the flavor profile of pecorino with truffles is not in your budget, you may reconsider. Plum Market and Whole Foods have excellent pre-wrapped cheeses and, like Zingerman’s, staff available to cut cheese to your specifications. Busch’s, Trader Joe’s and Arbor Farms also have very good selections of top drawer cheeses, as well as cheeses Uncle Ed may prefer. They are pre-packaged so pay attention to the expiration date. If it’s within the next week or two, you may taste the packaging on your cheese. Know your budget going in and understand the palate of the people you’re serving. Tonight’s crowd is an eclectic group so, acknowledging the wide range of tastes, I’m creating a pluralistic platter. I’m including an aged gouda for the beer and ale drinkers, an imported camembert for the big red enthusiasts and a crandale for those who like their cheese gussied up for the holidays. Consider quality vs. quantity. When having a few friends over, I simply serve 1 cheese with a complementary wine. There’s nothing more interesting and enticing than one magnificent cheese that can stand alone. A couple more tips and I’ll put this blog to rest (now, I’m officially late). Diversify the milks that create the cheese and the texture of the cheeses (soft, semi-soft, semi- hard and hard). Always, always, always serve cheese at room temperature. Finally, serve your cheese with freshly baked baguettes. Basic Crostini may be made and stored several days in advance or use quality, plain crackers. Skip the seasoned crackers, especially when serving fine cheese. Oh– don’t forget the star fruit slices studded with a cranberry half! Happy Holidays! Arrange kale on a large, flat platter. Place grapes in the center. Arrange cheese around grapes, slicing some pieces for easier service. Cutting bite sized wedges of cheeses allows guest to taste the rind as well as the creamier parts. (It’s O.K. to eat the rind as long as it’s not wax or paper.) Keep cheeses separated on the platter; mild cheese lovers will not appreciate the smeared camembert on their havarti. Arrange orange slices around cheese. Center a cranberry half on the center of each star fruit slice and arrange on platter. Fill in holes with nuts or fruit. *The ingredients and garnishes listed below are merely suggestions or a starting point. 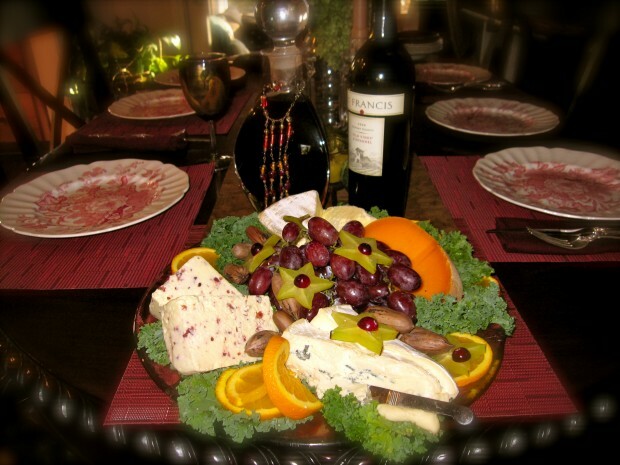 Have fun creating your own cheese platter according to your budget, palate and whims.